Tom Spencer has been named a Curators Distinguished Professor. Photo by Logan Jackson. Tom Spencer, professor of animal sciences, was recently named a 2018 Curators Distinguished Professor, the University of Missouri’s highest and most prestigious rank. This honor was established in 1968 by the University Board of Curators and is bestowed only upon outstanding scholars with established reputations. Spencer was a 2015 signature hire as part of the Mizzou Advantage program. 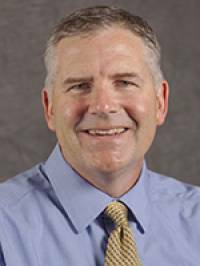 He joined CAFNR from Washington State University, where he was the Baxter Endowed Chair in Research, professor of animal sciences and molecular biosciences, and associate director of the Center for Reproductive Biology. Spencer received the 2018 Distinguished Researcher Award from the College of Agriculture, Food and Natural Resources. He has received $19 million in grant support as a principal investigator and co-principal investigator. Spencer is internationally recognized for his research in reproductive and developmental biology. His research uses a variety of animal models, including sheep, cattle, pigs and mice, to study the fundamental aspects of development and function of the uterus and placenta. The goal of the research is to understand the fundamental biology and genetic processes that are important for pregnancy establishment and success. In addition, he studies how to translate animal research to human medicine to solve fertility problems in women and improve their reproductive outcomes. Spencer has a joint appointment in the School of Medicine’s Department of Obstetrics, Gynecology and Women’s Health. He received his Ph.D. from Texas A&M University in reproductive biology.